Tamador volunteers as a media committee coordinator within her community. 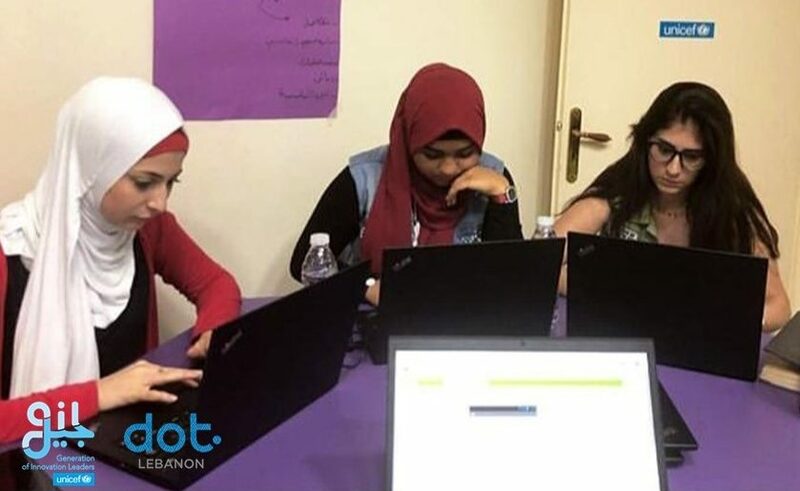 To enhance her marketing skills she decided to participate in DOT Lebanon’s social media marketing course and later, out of curiosity, joined the Mobile Application Development course– facilitated by DOT Lebanon under the GIL Program by UNICEF– unsure of what to expect. Shortly after enrolling in the courses, though, Tamador found herself facing crippling insecurities. She began to notice that she was having difficulties with learning the course material and made up her mind to quit. It was when her trainer, Jihane stepped in to offer encouragement and support that Tamador changed her mind. Tamador gave the workshops another shot and found herself becoming more engaged and passionate about the work. When the coursework first asked participants to begin thinking of and working on project ideas, Tamador and her team wanted to help people suffering from breast cancer. They conceived Beat that Cancer, a mobile app designed to raise awareness for breast cancer, and made a film to empower and encourage women to go in for their annual medical checkups. The team participated in the MIT App Inventor competition and won the App of the Month prize, being selected among hundreds of applicants and inventors. Upon presenting Beat that Cancer, Tamador felt confident and was enthusiastic to prove and show how small efforts lead to bigger impacts when one perseveres. Last month, Tamador sent her trainer Jihane a letter to thank her for her help and encouragement. See the letter below. I am writing you this letter to thank you for all what you have given me and my friends during the mobile app formulation. In the beginning, everything was difficult, but it also reminded us of our abilities, and we were each motivated to carry on. I registered in the DOT courses out of curiosity, but little did I know that what would await me was much more difficult than I had imagined. I was saddened and felt like quitting until you helped me. It was because of your careful teaching techniques, constant follow-ups and encouragement that I was able to overcome these obstacles. Creating a mobile application from scratch was something I didn’t think I could do, but it is now my reality. Beyond this, working with my team even helped me to develop my personal skills! It was an amazing and overwhelming experience. For me, the most amazing part of the whole course was you checking in and helping us even more after we had presented our project. You helped us to upload the app on play store which meant a lot. You made us feel that we were important and that our project would do great things for those suffering from cancer! It ended up being one of the best experiences I have ever participated in, and I can’t thank you enough for what you have done for me and for us as a team. I hope that we will have the opportunity to meet and work together again soon.